Published on high quality gloss paper in portrait format and with the outer and back inner in colour. The rest of the 35 pages are in black and white format. 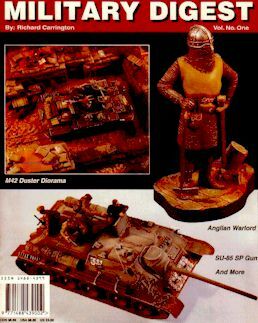 It has the following articles Polish 7PT tank, Junkers Ju 87, Taking a Break, M42 Duster, Anglo Saxon England Figure and Bust. I had to read the articles twice to really try to understand what part of the market the author is aiming at. Is it the Historical section or the model makers? In the end I could not make up my mind for it fails to convey anything new to me. The Historical write ups are best left to more qualified authors who at least do original research and the modelling section is in it's present format just frankly a waste of paper. I could not understand why the author did not set out his aims in an editorial in the opening pages and to have to search out the address and the web site half way through is chronic. Then to have to visit the web site to find any sort of editorial and how often he intends to publish; leaves me wondering if the author understands how to put a magazine together. I cannot recommend this magazine and I am glad I did not spend my money on it. Kindly supplied by P Smith via John Burrows.